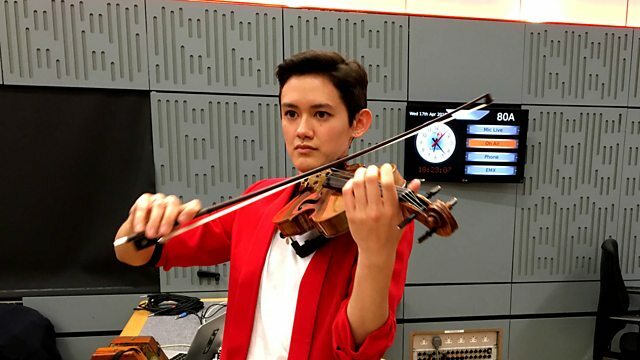 On the day of the 2019 Proms launch, Sean Rafferty presents live music from artists across the festival, including Stephanie Childress, Crewdson and Cevanne, and 12 Ensemble. Performer: Royal Concertgebouw Orchestra. Conductor: Bernard Haitink. Orchestra: Bournemouth Symphony Orchestra. Conductor: Marin Alsop. Adams: The Shaker Loops/The Wound Dresser: Bournemouth Symphony Orchestra/Alsop. Performer: Bayerischer Rundfunk. Conductor: Mariss Jansons. Performer: Martha Argerich. Orchestra: Orchestra Mozart. Conductor: Claudio Abbado. Mozart Piano Concertos K.503 and K.466. Performer: Gerald Moore. Singer: Janet Baker. The Very Best Of: Janet Baker. Performer: Renaud Capuçon. Performer: Frank Braley. Beethoven, The Complete Sonatas For Violin And Piano: Capucon, Braley. Orchestra: Royal Stockholm Philharmonic Orchestra. Conductor: Karina Canellakis. Performer: Stephanie Childress. Performer: Kumi Matsuo.